One month after censuring a colleague for uttering a racial slur, the House of Delegates is prepared to rebuke another lawmaker accused of being a serial abuser of his staff. The Joint Committee on Legislative Ethics issued a searing report Monday night on Del. 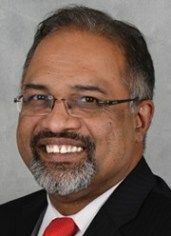 Hasan M. “Jay” Jalisi (D-Baltimore County), detailing five years’ worth of incidents in which the second-term lawmaker was verbally abusive to his office staff and central General Assembly staffers. Jalisi, the report said, created a “toxic” work environment and ignored repeated requests from House Speaker Michael E. Busch (D-Anne Arundel) and other top lawmakers to temper his behavior and take anger management and workplace civility courses. Following a closed-door 40-minute meeting Monday afternoon, the ethics committee unanimously recommended that the House vote to reprimand Jalisi – and a full House vote is expected to take place later this week. Del. Hasan M. “Jay” Jalisi (D-Baltimore County) is expected to face an official reprimand from his colleagues later this week for allegedly abusing legislative staffers. If Jalisi does not complete anger management and workplace civility courses before the 2020 legislative session, the ethics committee is recommending that he be stripped of his committee assignments and possibly face further disciplinary measures – the punishment that was meted out to Del. Mary Ann Lisanti (D-Harford) last month after colleagues heard her utter the N-word in an after-hours Annapolis night spot. The House voted 137-0 to censure Lisanti, who has resisted calls to resign. The 16-page report outlines startling behavior by Jalisi, dating back to his earliest days in the House in 2015. The ethics committee launched a full-scale investigation on Feb. 5, at Busch’s request, interviewing 38 individuals, collecting 17 sworn affidavits, and hearing sworn testimony from 18 individuals. Year after year, the report shows, Jalisi was verbally abusive to his staff members, especially to women, and also threatened General Assembly staffers, including those who have worked for the legislature for decades. Many reported never facing such abusive behavior from a lawmaker before. Prior to this year’s legislative session, the report continues, Jalisi was forbidden from putting anyone who worked for him on the General Assembly payroll. Nevertheless, the ethics committee alleges, he hinted to some staffers who appeared to be working on a voluntary basis that they would eventually be paid, but then did not follow through on his promises. 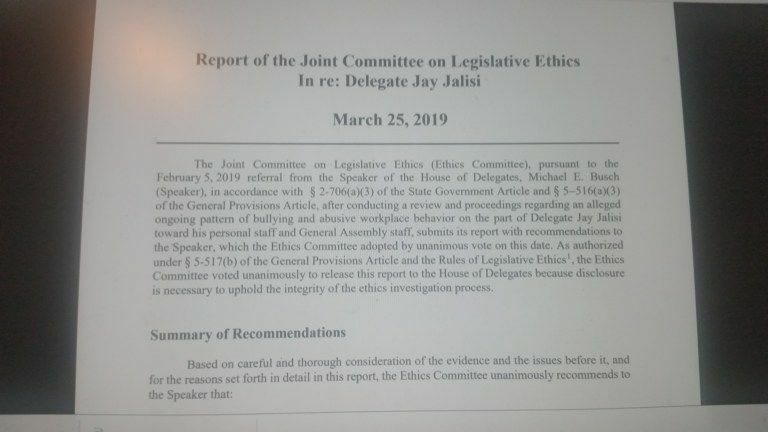 The report by the ethics panel, which includes delegates and state senators, lays out how the investigation was conducted and when Jalisi was brought into the process. One member of the ethics committee, House Speaker Pro Tem Adrienne A. Jones (D-Baltimore County), represents the same district as Jalisi and recused herself from the proceedings. She was replaced on the panel for this case only by Del. Benjamin Barnes (D-Prince George’s). The report says Jalisi declined to testify when given the opportunity. He was not in the House chamber during the regular floor session Monday night and could not be reached for comment. Jalisi’s political career has been marred by controversy, starting with the 2014 campaign, when a Republican rival alleged that the Democrat did not live in the 10th District, where he was running for a House seat. During that same campaign, Jalisi sued three former campaign workers for defamation. Soon after arriving in the legislature, Jalisi’s teenaged daughter sought and received a temporary protective order against him following a physical altercation. That incident prompted Busch to remove Jalisi from the House Judiciary Committee, which considers family and domestic violence legislation, and assigned him to the Environment and Transportation Committee. Jalisi, 53, was a medical doctor, with a degree in otolaryngology, specializing in diseases of the ear and larynx. More recently, he has been a real estate investor and financial adviser.